You’ve no doubt heard of the boy who cried “wolf.” But you have probably not heard of the little girl who called “Wolf” as she clamored after the big brother she was totally devoted to. That would be Savannah Stoner, a writer who, in her essay “Wolf” below, shares a “howl of affirmation” for the beautiful yellow eyes on her beloved wolf T-shirt. And below that, I share a “prize-winning recipe” for… wolf. Ha ha….well, not exactly! While I do share a recipe, and Savannah did use it to write about “Wolf,” you can use it to write about whatever (or whomever) you love — and find beautiful. Bon Appetit! Yes, this is a tip of the hat to Julia Child, written on the day that would have been her 101st birthday. She was a writer as well as a cook, after all. And she was beautiful. I realize not everyone would agree. “Beautiful” in 2013 is a word that often has Botox behind it, a word that has everything to do with image, not substance. But beauty has always been “in the eye of the beholder”. 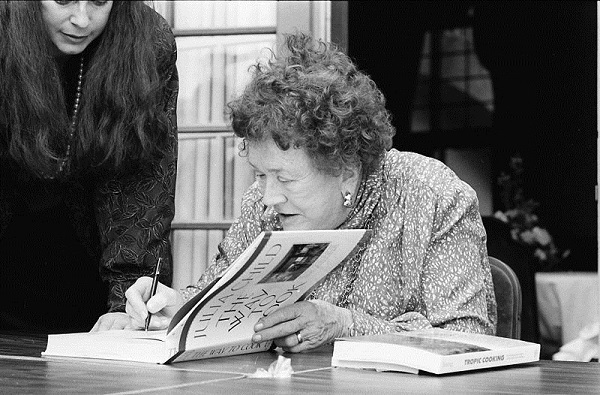 What do your eyes see when you look at this photo of Julia Child at the Miami Book Fair International in 1989 at age “77.25”? Our best writing comes when we look deep, examine what’s under and behind the image, when we are willing to tell the truth of what (and whom) we find beautiful — and why. I have always loved Joe Cocker’s song “You Are So Beautiful” for speaking to this kind of beauty through those two little words “to me”, the kind of beauty Savannah finds in a faded graphic T-shirt, the kind of beauty you’re invited to write about in the prompt below. Twenty-seven years after my brother Worth gave me this large, white graphic T-shirt inked with the black image of a wolf standing guard over a winter wood, I unfold it, my favorite, from atop a stack of other less inspired tees of basic white, pink, brown, and grey. You solid shirts must be jealous as you languish, knowing that I feel most myself when I wear my beloved wolf tee. Blessed be tees that provide, if not Gwyneth chic or Angelina cool, comfort and an unexpected smile from a stranger at the Farmer’s Market who, detoured from his Saturday morning search for the sweetest, plumpest strawberries, pauses, rapt by the piercing yellow eyes of the wolf, and lets out a howl of affirmation. I am not alone. Could my brother have known when he gave me this shirt how I would treasure it all these years? Did he think it in style, a trend, a fad, a joke? Or did he recall his little sister, clamoring after him, crying, “Wolf, Wolf,” her lips pursed, almost whistle-ready, her tongue too young to curl and flick against her teeth when calling her brother’s name, but her devotion too great to ever stop trying. Now, eighteen years after his death, could Worth ever have guessed how many Goodwill bags from which his gift would be spared? How many times its existence would be defended? You can always see it coming. My sister pulls into the driveway, catches me planting, willy-nilly, a patchwork of morning glories and tiger lilies around the lamppost. “You’re not wearing that shirt out of the yard, are you?” she asks. “What would it hurt?” “Promise me,” she says. “You know our mother raised us better.” But I can’t promise what I know to be a lie. My brother taught me better. Granted, I would not get married in this shirt: there is a tiny hole in the side, the wolf’s black nose has faded, his yellow eyes have dimmed with age. But I’ll never see the harm in wearing it to the gas station to grab a Dr. Pepper, or the grocery store to pick up paper towels, or the post office to mail a package for that matter. I tell my sister, “Don’t worry. It’ll be fine.” People love this shirt. I finger the hem and think words I dare not speak: if cremation ever loses its charm, I should be buried in this shirt. Read “Loving Bald Men.” You can read it online here. (The examples from the parentheses are from this essay). Pick a subject to write about, something you love (quirky, and unexpected is good, but not necessary). EX: Loving sunrise walks at the beach, free samples, the T-shirt your brother gave you, etc. 4. Take the “ingredients” and use them to “assemble” your essay. Note: At least one other Under Construction class member published her resulting essay. Sound too complicated? Feel a bit intimidated? It’s way more fun to begin your essay in a WordPlay class, and be able to share it when you’re done. You can find out more about Under Construction and other classes here. Thank goodness for Maureen Ryan Griffin! 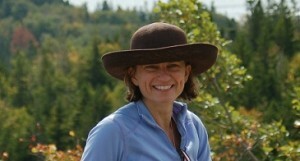 She is far and away the most amazing, generous writing teacher I’ve ever had. Her enthusiasm for words and the myriad ways in which they can be put together is contagious. Maureen cares so much about creating an emotionally rich environment in which her students can share their stories that she has helped me to shift my attention away from worries about how well my writing might be received and refocus my attention on the way I feel about the characters in my stories, the way the characters care about each other, and the way everyone in class supports each other and celebrates each other’s work. I’m constantly blown away by how everyone’s writing has blossomed. Several of us have had pieces published and/or have read them as commentaries on Charlotte’s NPR Station WFAE 90.7. Two of my essays, “The Fine Art of Singing Badly” and “Fried Lemons in Heaven,” were NPR commentaries; my “Fried Lemons” piece appeared in Imagining Heaven: An Anthology of Personal Visions of Heaven; and I was among several contributors to be invited to read my piece during the Sensoria festival at Central Piedmont Community College. Most recently, my essay, “Wolf,” appeared in the June issue of Sasee magazine. None of these successes and experiences would have been possible without Maureen’s guidance and encouragement, her writing prompts and recipes. Even though my anxiety still sometimes gets the better of me, I’m so grateful for the other times when I can write in spite of my fears, and I relish the breakthroughs when all those old, nagging worries fall way. Thanks to Maureen and the community of my writing mates,I’ve been able to savor the writing process in a way that had too often escaped me in the past.